In our ladies Sunday school class I am teaching through the book of Genesis. Last week’s lesson was from Genesis 27 -29 about Jacob and Esau. I’m sure you remember the story. After twenty years of being barren Isaac prayed for his wife Rebekah and she conceived and bore twins, Esau was the first born and Jacob second holding onto Esau’s heel. The Bible tells us that Esau was a red, hairy hunter and that his father, Isaac, loved him. It also tells us that Jacob was a plain man, dwelling in tents and was loved by his mother. One day after an unsuccessful day of hunting, Esau comes into camp and sells his birthright to Jacob for some lentil stew. As Isaac approaches death he sends Esau out to hunt some venison and bring it to him so that he can enjoy a meal with his son and give him the blessing. (Remember Isaac is challenging the will of God. God had already told Rebekah that the elder would serve the younger in Gen. 25:23) Rebekah overhears and tells Jacob to bring in two kid goats for her to fix, dress up in Esau’s clothes, and trick his nearly blind father into giving him the blessing. Isaac thinking that Jacob was Esau does indeed bless him. When Esau comes into his father they discover the deception. Esau vowels to kill Jacob as soon as his father dies. Jacob is then sent far way for his own safety and to find a wife. Wow! What a story. There are many lessons that can be learned from this story. The first lesson is how dangerous it is in a family when parents show partiality to their children. The children grow up despising one another which creates a very dysfunctional family. Another lesson is about making good decisions. When it comes to making decisions, the first thing to know is the will of God. 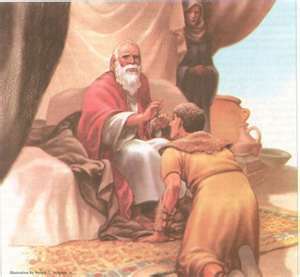 Isaac knew the will of God concerning which son was to receive the blessing. (And we, as well, can know the will of God through His Word.) However, just knowing the will of God is not enough. You must be submissive to that will. Isaac was not. Another lesson from this story is that you reap what you sow (Be not deceived; God is not mocked: for whatsoever a man soweth, that shall he also reap. Gal 6:7) Jacob lied to and tricked his father but a few years later (7 years in fact) he is the one that is tricked (Genesis 29). There is another lesson. It is that Hollywood or anything the world has to offer can never compare to God’s Word. I have had people tell me that they do not like reading the Bible because it is boring. Really? This story alone is amazing. (Not to even mention the spiritual applications.) You couldn’t make this up. It has action, suspense, drama, deception, love, and hatred. Next time you want to be entertained forget watching a movie; just pick up your Bible. All of these are great lessons but there is another that I believe is very important for every person to learn. That is the lesson of Esau. He sold his birthright because he despised it (Genesis 25:34). Hebrews 12:16 calls Esau a “profane person”. A profane person is one who has no respect for the things of God. It goes on to say, “when he would have inherited the blessing, he was rejected: for he found no place of repentance, though he sought it carefully with tears, (vs. 17). I believe the lesson here is that it is not necessary a person’s sins and failures that will bring them to ruin. What will bring them to ruin is when they sin and they fail to repent. You see, all the characters in this story sinned. But it was Esau who “found no place of repentance.” The Bible is full of story after story of people just like you and me, full of sin, which God used because they had a heart of repentance. I am so thankful that perfection is not required to receive God’s blessings – just a “broken spirit: a broken and contrite heart”. Disagree with assessment of Esau’s character. One of the most misunderstood character. He may have been a simpleton and brawny as portrait in genesis but in the end he became a very rich and powerful man with a very big heart. It his act of forgiveness in embracing his brother and his willingness to share what he has despite the wrong done to him. Many of us are Jacob, but not many can be an Esau. Thanks for your comment. I certainly agree that Esau became rich and powerful and his record of forgiveness is a lesson we can all learn from. But let’s not forget what God’s Word says about him in the New Testament.